23 local primary schools have joined JT’s 2017 ‘Books for Tablets’ recycling campaign this year. With every 150 phonebooks collected by each primary school, JT will donate to them a Smart Tablet. At the end of the recycling competition, the school that has collected the most directories also wins a free digital workshop. The new 2017 JT Directory is being delivered to all homes and businesses in Jersey over the coming weeks. Additional copies will also be available for collection at JT’s Queen Street store once distribution is completed. JT has joined together with Jersey Post this year to help ensure the 2016 telephone directories can be disposed of. Especially in an environmentally responsible way across the Island. Jersey Post will collect directories from the recycling points set up at The Co-operative Grand Marché. Also at St Peter and St Helier, the Parish Halls. As well as at the new Household Reuse and Recycling Centre at La Collette. The JT ‘Books for Tablets’ competition runs from 18th April to 20th May. 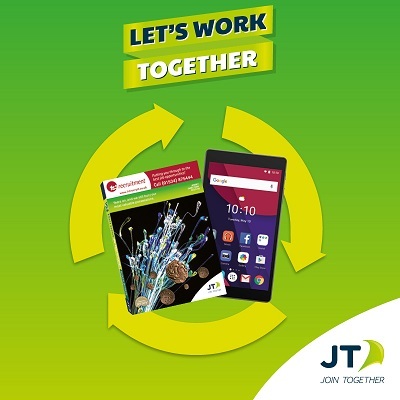 For every 150 phone books collected, JT will donate one tablet to the primary school. 24 schools are taking part in this year’s competition. Last year 8,312 directories were collected and 60 tablets donated. Photograph: Last year’s winners, St Luke’s Primary School, who collected a total of 2,250 and were presented with 15 brand new Alcatel tablets by JT.